(Photo: Reuters / Toby Melville)Flowers and notes are seen left in memory of victim Drummer Lee Rigby, of the British Army's 2nd Battalion The Royal Regiment of Fusiliers outside an army barracks near the scene of his killing in Woolwich, southeast London May 23, 2013. The gory killing of a British soldier at the hands of two suspected Islamist militants has shone a spotlight on Woolwich, the London district where it happened, stirring racial tensions in one of the most ethnically diverse parts of Britain. As hostility against Muslims and black people heightened at the weekend Christian and Muslim groups in Britain pleaded for calm after condemning the brutal killing of an off-duty soldier in London by attackers who said they were doing it in the name of Islam. 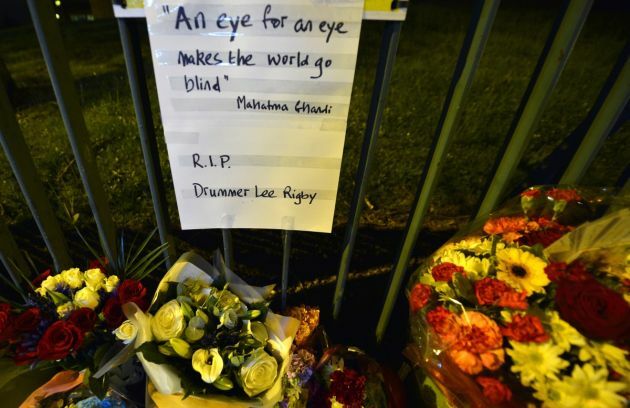 Drummer Lee Rigby, 25, a married father with a two-year-old son, who had served in Afghanistan was attached to the Regimental Recruiting Team in London was hacked to death by two men in a Woolwich street in South East London on Wednesday. Police have arrested two suspects, both said to be students at the University of Greenwich, one the 22-year-old son of a Nigerian Christian probation officer who turned to Islam according to his mother, The Daily Telegraph reported. Anti-Muslim attacks soared in Britain after the attack groups monitoring them said. "We share the absolute horror felt by the rest of British society at the sick and barbaric crime that was committed in the name of our religion," said the Muslim Council of Great Britain soon after the killing. It said, "No cause justifies this murder," while pleading for calm in all communities. "We condemn this heinous atrocity in the strongest possible terms. It is a senseless act of pure depravity worthy of nothing but contempt," it read. "This is a truly barbaric act that has no basis in Islam and we condemn this unreservedly." In a joint press conference with British Muslim leader Shaykh Ibrahim Mogra, the Archbishop of Canterbury, Rev. Justin Welby, praised the responses of different faith groups to the incident and said this is "very much a time for communities to come together." Welby said, "We have all been horrified by the brutal murder of Drummer Lee Rigby in Woolwich. "All of our prayers and mine are with Lee's family, with his colleagues and comrades, and all those who witnessed this crime and all those in the community who have been so affected by it." The Archbishop also said, "I want to recognise the response of churches, mosques and other faith and civil society groups as well as those of brave individuals who have done so much to bring our communities together at this time." He was speaking in Leicester, central England, a city with a large Muslim population. "The strong response from the Muslim Council of Britain and many other organisations has rightly emphasised that these acts have no place in Islam," said the spiritual leader of the 80-million-strong Anglican Communion and senior cleric in the Church of England. The Interfaith Network said in a statement, "The attackers linked their actions with the religion of Islam. "Statements from major national Muslim bodies have, in the ensuing hours, condemned the act in the strongest terms and stressed its lack of connection to – and complete contradiction of – teachings of Islam. Even so, there have been attacks on two mosques over the course of the last 24 hours and concerns expressed about the possibility of further attack." Protesters on a march Saturday organized by the far-right English Defence League told CNN that the soldier's killing in southeast London, had opened their eyes to the country's situation, and they called for Muslims to leave. Faith Matters, a group which works to reduce extremism, said its helpline had been inundated with reports of attacks, including some on mosques, The Telegraph newspaper reported on Saturday. It said that before the killing in Woolwich between four to eight cases a day were reported but it that had received up to 150 in the last few days. Fiyaz Mughal, director of Faith Matters, told BBC Radio, "What's really concerning is the spread of these incidents. They're coming in from right across the country. "Secondly, some of them are quite aggressive very focused, very aggressive attacks. And thirdly, there also seems to be significant online activity ... suggesting co-ordination of incidents and attacks against institutions or places where Muslims congregate." The Guardian newspaper Saturday cited a poll that found nearly two-thirds of people in Britain believe there will be a "clash of civilisations"' between British Muslims and white Britons following the murder of the British soldier in Woolwich. The number of those who believe such a clash is inevitable has increased by 9 percent from last year, the YouGov poll found.